There are many types of oscilloscope probes each with its own field of application. The probe takes care of the very critical coupling between the measured object and the oscilloscope. Fig. 1: Equivalent-circuit diagram input impedance probe. Passive probes are the most commonly used probes for oscilloscopes. These probes are all too often considered as ideal, however, nothing is less true. The input resistance will usually be taken into account, but the input capacity, that plays a major role at high frequencies, is mostly forgotten. At still higher frequencies, also the length of the sprunghook and ground lead will play a role. This can be substitute as inductors in series with the probe. Fig. 2: Measured attenuation of a 60 MHz probe at 1:1 and 1:10 settings. Some passive probes are equipped with a switchable attenuator, usually switchable between an attenuation of 1:1 and 1:10. It's important to realize that the specified bandwidth of the probe is only valid for the 1:10 attenuation setting. Not only the bandwidth, but also the phase error in the 1:1 mode is a lot worse. The figures 2 & 3 show the results of a measurement on a switchable 60 MHz probe in the 1:1 and 1:10 mode. This measurement is done by compare it with a 500 MHz 1:10 probe. Both the tested 60 MHz as the 500 MHz reference probes had the same cable length. A 500 MHz oscilloscope is used. Fig. 3: Measured phase shift of a 60 MHz probe at 1:1 and 1:10 settings. The relative attenuation is shown in figure 2. The bandwidth is usually specified by a ±3 dB limit. The probe in the 1:10 position reached the 3 dB level at 60 MHz as specified. In the 1:1 attenuation position the -3 dB level is exceed at 20 MHz, this is a lot lower than the specified 60 MHz. The results of the phase shift measurement in figure 3 shows a remarkable image. In the 1:10 attenuation position the graph is relatively flat with a maximum error of -7 ° in the range from DC to 60 MHz. In 1:1 mode the phase error becomes already significant from 1 MHz, and at 10 MHz the phase shift exceeds 20 °. At 60 MHz the phase error is rose up to 90 °. If a phase comparison is carried out between a 10 and 20 MHz signal with the probe in the 1:1 mode, then the error introduced by the probe is already about 20 °. Fig. 4: Impedance curve of a 1:1 probe: 1 MΩ, 45 pF, 1:10 probe: 10 MΩ, 12 pF and a 50 Ω, 8 pF scope input. 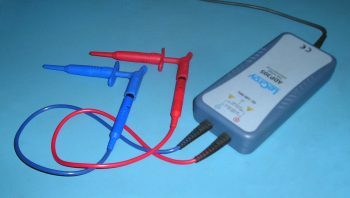 An oscilloscope probe will always become an extra load to the object being measured. How large is this load is depends on the probe and the frequency of the signal. Figure 4 shows the impedance of various probes plotted against the frequency. This is the calculated impedance of a 1:1 probe (red) with an internal resistance of 1 MΩ and a parallel capacity of 45 pF. The blue line is the characteristic impedance of a 1:10 probe with a resistance of 10 MΩ and 12 pF in parallel. Both probes have an impedance similar to the ohmic resistance of the probe in the range from DC to about 1 kHz. Above 10 kHz, the reactance of the parallel capacities becomes significant. The load that the probe forms at the measured object is increasing sharply as the frequency increases. At 1 MHz, the impedance has already dropped to about 3.5 kΩ for the 1:1 probe and approximately 13 kΩ for the 1:10 probe. A 1:10 probe has not only a higher ohmic internal resistance but also a smaller input capacity. By this is the impedance at high frequencies more favorable. This impedance reduction vs. the frequency also has implications for the maximum permissible voltage at higher frequencies. As a result of a decrease in impedance the current will increase, which in turn affects the dissipated power. Figure 4 shows also the impedance characteristic of a 50 Ω // 8 pF oscilloscope input. This direct input is highly favorable for wideband and high frequency measurements. However the measured object is much larger at lower frequencies, the impedance will be constant from DC to 100 MHz. Probes and their accessories have a strong influence on the measured results. Below are a number of examples shown how different probe configurations affect a measurement. The circuit on which is measured consists of a 74F04 hex inverter which conditions a 700 kHz square wave derived from a function generator. Next to each measuring arrangement photo a scope screen dump is shown. The upper trace shows the full period, and the lower trace shows a detail of the rising edge. In the first example a 1:10 500 MHz probe is used. 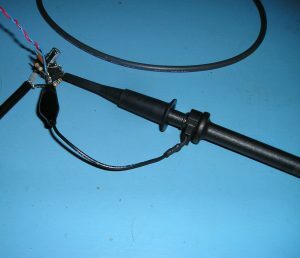 The probe is fitted with a sprunghook and an 11 cm long ground lead whereby the connections to the test circuit is made. Fig. 5a: Probe head with a normal sprunghook en groundlead. Fig. 5b: The measurement results. Clear to see is that an overshoot occurs followed by a damped oscillation. This is caused by the self-induction of the ground lead and sprunghook in combination with the input capacity. Better probes are supplied with a bayonet style ground lead that can be mounted on the probe head. The ground connection is therefore only a short pin. The same 1:10 500 MHz probe is used as above. Fig. 6a: Probe head with bayonet style groundlead. Fig. 6b: The measurement results. Still an overshoot is visible, but it is much smaller than in the example above and the ringing is almost disappeared. Probes should have an as short as possible connection to circuits where higher harmonics signals are measured. Simple test leads are unsuitable for high frequency oscilloscope measurements. As an example a measuring arrangement with one meter long leads with banana plugs. These are connected with a BNC to banana adapter to the oscilloscope. With crocodile clips at the other end of the measurement leads a connection is made to the test circuit. Fig. 7a: Measuring arrangement with simple measurement leads. Fig. 7b: The measurement results. The measured result is a mess. By measuring with long lines and thus relatively large inductors combined with the input capacity of the oscilloscope, a lot of additional oscillations are created. Only on low-frequency signals where higher harmonics are absent it's possible to use standard cables. Fig. 8: High-voltage differential probe. Standard probes measure the voltage relative to the ground. If multiple probes are used, the multiple ground connections to various mass points will create ground loops. This can seriously distort the measurement and will lead to incorrect measurements. A differential probe can prevent this. This type of probe measures the voltage difference between the two terminals of the probe. Fig. 9: Principle differential probe. Some types of differential probes are specially designed to measure high voltages. With use of such a high voltage differential probe can be measured on voltages connected to the power grid without danger and the scope can remain grounded. A strongly discouraged but common practice is to use normal probes when measuring objects that are connected to the power grid. To avoid short circuits between the line voltage and earth of the oscilloscope, the oscilloscope is than disconnected from the earth. This method will result in very dangerous situations. The complete oscilloscope is connected to the line voltage. In addition, normal probes are not designed for these high voltages. Fig. 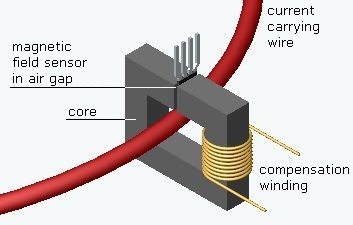 10: Example of a DC current probe placed around a conducting wire. Currents can be measured by measuring the voltage across a known resistance. A major disadvantage is that the circuit has to be opened to insert this shunt resistor. This additional resistance can also affect the measurement by its burden voltage. Also is there still a galvanic coupling that often is undesirable. This can cause problems at high voltages and there are limited places where the current can be measured. Fig. 11: Basic circuit of a DC current probe. Currents can also be measured with a current probe, also known as a current clamp. These probes don't have the disadvantages of shunt resistors as described above or at least in a much lesser extent. A current probe is simply clamped over the current carrying wire and the circuit doesn't have to be opened. 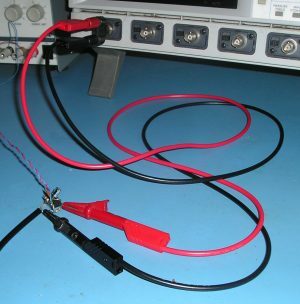 Current probes are roughly divided into two types: AC and DC current clamps. The AC current clamp is basically a transformer. The primary winding is the conductor who carries the to be measured current, and the second winding is fixed onto the core and is connected to the oscilloscope. This is a passive probe and can handle only alternating currents. Fig. 12: Construction DC current probe. A normal transformer can't deal with DC currents. Therefore the operating principle of DC current probes is rather different from AC probes. Here also is the current carrying conductor the primary winding and is inserted through the core opening. There is also a secondary winding, but now it functions as a compensation coil. The core is provided with an air gap that holds a sensor, e.g. a hall-sensor, which measures the magnetic flux in the core. The current in the primary wire will magnetize the core. This magnetic field is measured with the sensor and as a result of this, the control circuit runs a current through the compensation winding in a way that the magnetic flux in the core is kept zero. As a result of this the core will never be magnetized. The advantage is that the non-linear properties and hysteresis of both the core and the magnetic sensor have little influence on the measurement results. Beside the described measurement circuit there is also demagnetization circuit. Before using the current probe the core must be degaussed without wires inserted in the core. If the measured current is small in relation to the full-range, the sensitivity can be increase by turning the current carrying wire multiple time's trough the core. The sensitivity is increased in proportion to the number of times that the wire runs through the probe. Keep in mind that by increasing the sensitivity in the manner described reduces the bandwidth. Currents can be added by leading all the wires of which is the total current must be know though the probe. Caution must be made on the current direction in each of the wires. Similarly, a differential measurement can be performed. 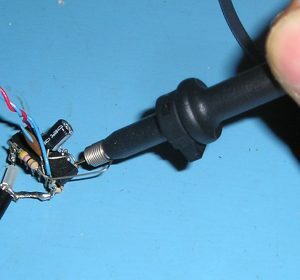 The two wires should be led in reverse directions through the probe. Signals are not infinitely fast transported by cables. The propagation speed of signals trough cables depends on the type, and most of all the length of the cable. If only the same cables or probes are used, there are no signal delay issues. However, if different cables are used, then the signals will not arrive at the same time at the oscilloscope. By this time difference, phase differences will appear. These phase differences are especially noticeable at higher frequencies. Also signals that are processed by electronics in differential and flow probes undergo a certain delay. Fig. 13: Difference in cable delay times cause phase shifts errors. The image above shows the difference in delay between two cables connected to the same voltage source. Channel 1 measures the signal by a 500 MHz passive probe with a cable length of 1.2 m. Channel 2 measures the same signal via a 0.5 m RG58 cable correctly terminated with a 50 Ω resistor. The difference in delay time between these two cables is 2.8 ns. In this case of a signal of 20 MHz, the phase shift tdelay*frequency*360degº = 2.8*10-9*20*106*360º = 20.16°. It is therefore recommendable to use the same cables for measurement, or else calculate the delay time of the cables and/or probes in effect.